Christmas Deals in Budapest: packages, tours, dinners, etc. A nice winter boat ride on the river Danube in Budapest, the Mulled Wine Boat Tour will make your Christmas holiday in Hungary even more festive. As the sun sets early in December, you will see the sights lit up along the river Danube in this 90 minute boat tour in a heated ship. The tour also gives an option to sip on Grogs, or for those who do not enjoy hot alcoholic drinks, the price includes cocktails or beers. Ideal way to rest your legs for a while. You can watch the sights from the heated ship, or climb atop the deck and take in the views with your hot mulled wine to keep you warm. Needless to say enjoying a mug of mulled wine at the Budapest Christmas markets is an excellent program, especially while the music is on, and the bands play on the stage of the Budapest Christmas Market on Vorosmarty Square, or when the light painting goes live on the facade of St Stephen’s Basilica where the other major Christmas Market attracts thousands of visitors in winter. 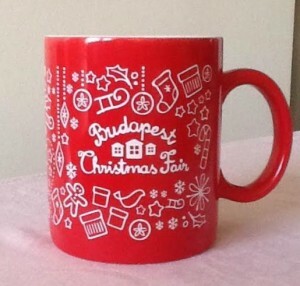 You can even take away the red mug of the Budapest Christmas Fair as a nice memory. Listening to a beautiful classical music concert in an 18th century Neo-Renaissance & Baroque church in Budapest sounds perfect for a really elevated Christmas evening. 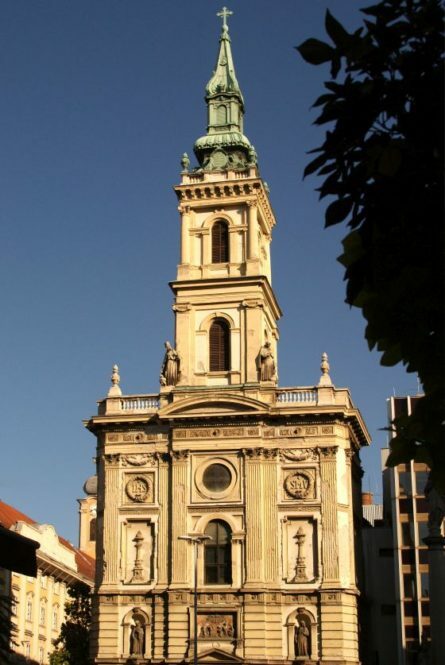 The concert in St Anne’s Church in the city centre of Budapest will surely let you feel the innermost joy only classical music can convey in a church environment, each note touching the spine and skin. The program is subject to change each year. The Christmas concerts start approx. 6 pm and 8 pm depending on the date. But one thing is sure, it will be a beautiful festive concert to take part in with the music of Bach, Handel, Gounod, Albinoni, Schubert and more. 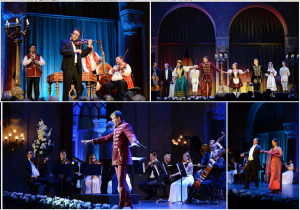 The classical concert is a perfect program for Christmas Eve, and a nice gift to enjoy together for music lovers. 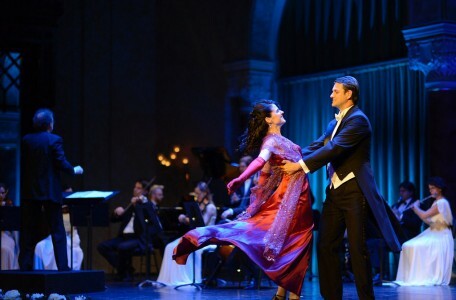 Booking tickets online in advance is warmly recommended as there are very few events in Budapest on Dec 24. How to get to St Anne Church? As St Anne Church is very close to the city center near Vaci utca shopping street, there are many ways to get to the church easily. Except for Dec 24, Christmas Eve, as this is the time when the public transportation gets infrequent (with buses running every half an hour or so) after 4 pm on Dec 24. Metro: the closest metro station is on the M3 blue metro line at Ferenciek tere (Franciscan Square) metro station in Budapest downtown (quite close to the white Elisabeth Bridge over the river Danube). The last metros leave at around 4pm, and then buses replace the metro cars for the rest of the day. Bus: there are many buses stopping on Ferenciek tere Square, the bus stop that is very close to St Anne Church, like bus number 7, 173, etc. Again, while these buses run very often on other days, on Dec 24 you may have to wait long minutes in the cold weather of Budapest winters. Make sure you get info about the details of the public transport from your hotel reception or from BKV.hu the public transport website. Budapest taxis: there are many taxis on Christmas Evening, So if you want to make sure that you get to the Xmas concert in time, you may wish to book a Budapest taxi in advance. At any rate, do not just hail down a cab if you do not want to pay 3-4x more than the usual market price for a taxi ride. 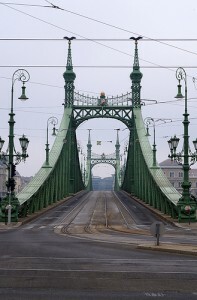 Here is a list of some of the most reliable, established Budapest taxis, taxi companies. 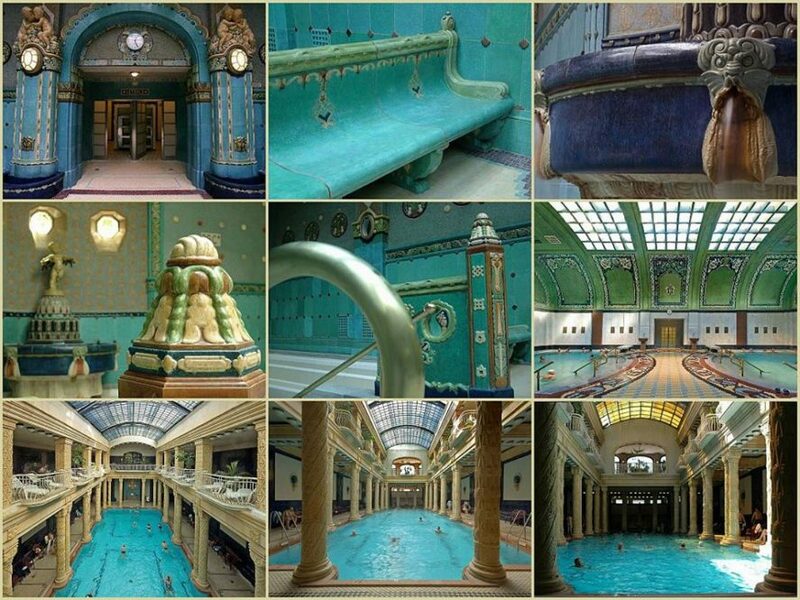 Are you planning to visit the pools in Gellert Spa in your winter Budapest visit? You can! Gellert Spa, similarly to Szechenyi Baths, is open every day of the year, including the Christmas holidays: Christmas Eve, Christmas Day and Boxing Day. You can get great spa treatments, massages, chocolate treatments, Cleopatra bath in the beautiful Art Nouveau pool palace of Budapest. Despite the winter colds, you can even take a bath outside: there is a smallish outdoor thermal pool filled with hot spring water, which is also open in December or January (if the weather stays above the freezing point). 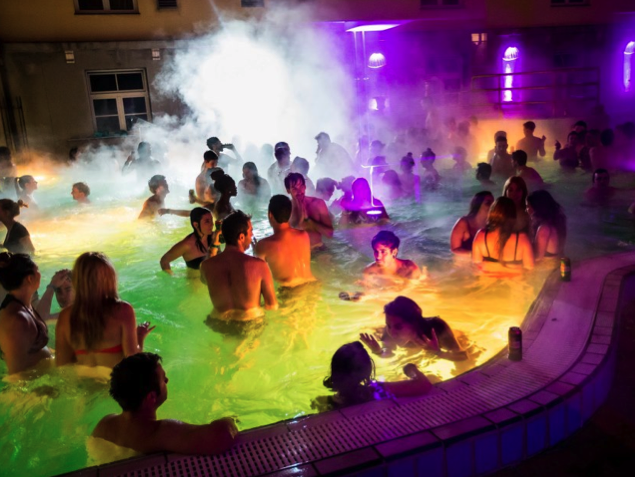 Lukacs Baths even features an extravagant pool party series in December: Magic Bath Parties. Budapest Baths are actually open, and are a lot of fun and relaxation for any winter visitors in Hungary. Do not miss the baths in December either! 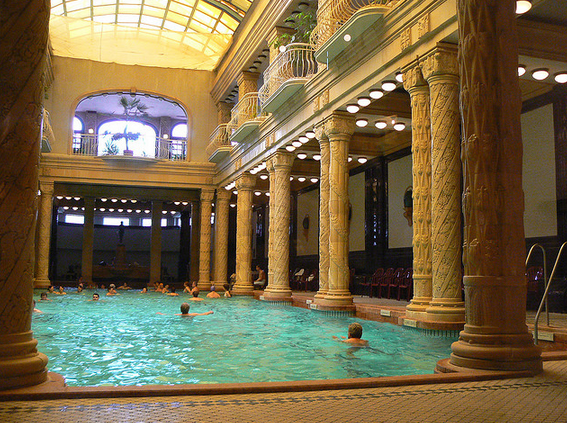 Dec 31: on New Year’s Eve the opening hours of Gellert Bath from 6 am to 6 pm. Great way to get some strength for the New Year’s Eve parties in Budapest! Jan 1: on New Year’s Day, the opening hours of Gellert Bath from 10 am to 6 pm. What a perfect way to cure any hangover and welcome the new year with healthy resolutions! You can even listen to a concert on New Year’s Day to make January 1 in Budapest really beautiful. Did you know that you can book a massage in Gellert Spa from approx. 21 Euros (20 minutes aroma massage at one of the best thermal spas of Hungary! With a bath ticket from 43 Euros! 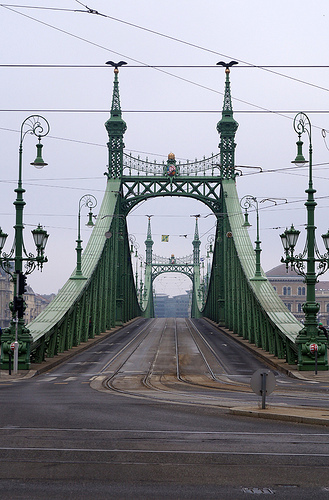 Budapest can be cheap, but this is a really a superb Christmas Deal, we think! You can buy it as a Gellert Spa Gift Voucher for others too.) Do not miss out on this fabulous opportunity. Book now in advance, or others will instead of you (Christmas and New Years can get really booked in Budapest, this applies to the Nutcracker ballet, or Budapest Christmas cruises, or massages in Gellert Bath in general). Are you in a mood to splurge with your love of life? 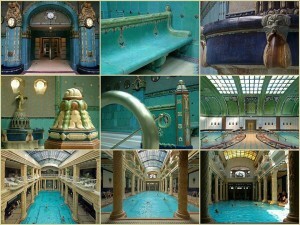 You can even book a private bath at the beautiful Art Nouveau complex. The private bath is not so spectacular with today’s standards (it was super high tech in the 1920s obviously), but you can have your privacy in Gellert Spa private bath for 3 hours or so. The sparkling wine and fruit bowl is included in the price, but the towels are not. Although the city of Budapest is a lot quieter during the three days of Christmas, especially on Dec 24, which is the most respected and intimate Christmas event in Budapest, the life on the river Danube does not stop for a moment. If you wish to add a beautiful scenic river cruise to your Budapest itinerary, you can join the merry locals and foreigners on one of the nostalgia boat rides. The ships are heated! If you do not mind the cold weather, you can even get up to the deck of the ship to toast, to pop the question, to take a deep breath and most of all, to let the UNESCO World Heritage attractions sink in. Let Christmas brings its full beauty, and warm lights to you. 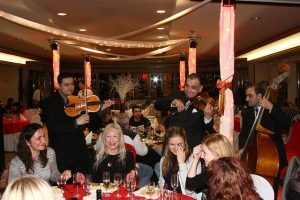 7 pm Cruise with A La Carte Dinner + Music: A La Carte Dinner Cruise in Budapest with Live Music on Legenda Sightseeing Boat: 4 course a la carte dinner of your choice. Dates: Dec 1-31, Thu-Sun, (except Dec 24). Candles lit, band playing aboard, servers bringing your delicious festive foods and drinks. 1 glass of champagne awaits for guests. 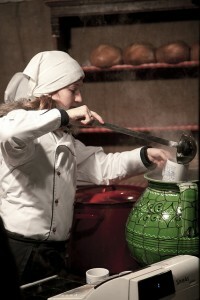 Boat: Legenda (heated in winter cruises). Hurry up to reserve for Christmas and NYE cruises! 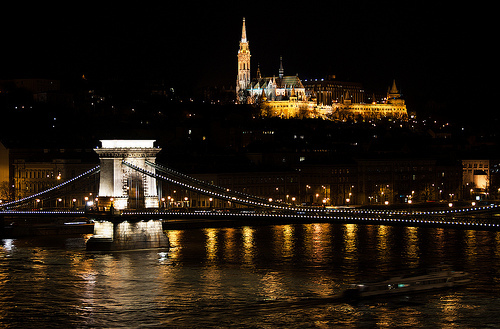 7.30 pm Budapest Cruise with 4 Course Dinner + Piano Music: festive 3 hour cruise with Served Dinner of 4 options for the Main Course (Fish, Duck, Beef, Vegetarian) and live piano music. 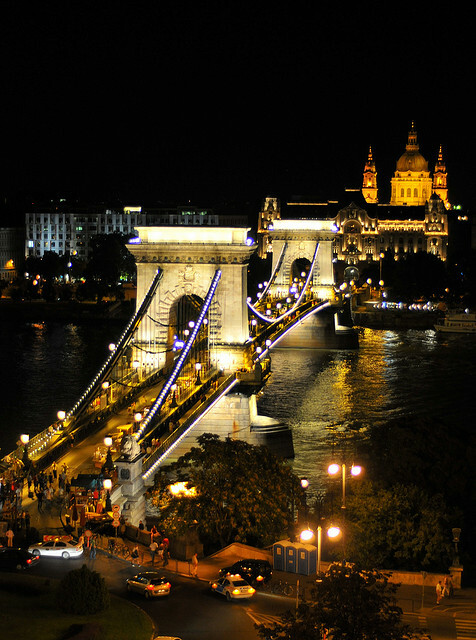 Dates: Dec 1 – 30, including Dec 24 the Budapest Christmas Eve cruise. Great value at €55 per person. 1 glass of sparkling wine also included in this price along with the 4 course served dinner, 3 hour cruise, live music. You can also upgrade for the cruise with unlimited drink package for 3 hours (€75 per person, including dinner, cruise, music plus unlimited wines, beers, soft drinks, hot drinks). Dec 24: Christmas Eve river rides offering daytime or evening cruises with sightseeing only or including dinner. These cruises are mini cruises in the city of Budapest, in and around the UNESCO World Heritage site inscribed in 1987 as the Bank of the Danube and the Buda Castle. You will cross under many beautiful bridges over the river Danube in Budapest, and be part of a boat sightseeing with beautiful sights along the riverfront: Buda Castle, Matthias Church, Fisherman’s Bastion, Gellert Baths and Hotel, National Theater, Palace of Arts, University of Economics, Central Market Hall, Pesti Vigado Concert Hall, Gresham Palace, St Istvan Cathedral, Hungarian Academy of Sciences, and the beautiful bridges themselves, like the Liberty Bridge, the Chain Bridge, etc. To widen your horizon and see more of Europe at Christmas time, see the European Christmas market cruises.